Dead Animal In Attic: It's very common for the wildlife living in your attic to die there. Why die outside where it's cold and wet, when you can do it in the comfort of your own home? When an animal dies in the attic, most of the smell accumulates in the house. It can be tricky to find it up there, because it might be buried under the insulation. But persistence always pays off, and I find the critter. Read more about - Dead Animal in Attic. Dead Animal In Wall: Animals sometimes live in walls or fall down a slick wall and are unable to crawl out. If you don't get them while they're alive and scratching, they die at the bottom of the wall near the baseboards, or wherever there's a support beam. To find a dead animal in the wall, I sniff and sniff until I find the right spot, then cut a hole to remove the carcass. I always fix the hole afterward. Read more about - Dead Animal in Wall. Dead Animal In Chimney: This is not terribly common, but it does happen, especially if you've got a slick metal chimney flu that the animals are unable to climb out of. If the animal is in the flu above the damper, it's not a problem. If they're between metal flues, then it is a big problem. I sometimes get animals out of the fireplace. Read more about - Dead Animal in Chimney. Dead Animal In Ducts: People always think the dead body is in the ductwork, but this is rarely the case. It's just that people are confused by the airflow, which stirs up the bad smell. It's not common for a critter to enter the AC system. 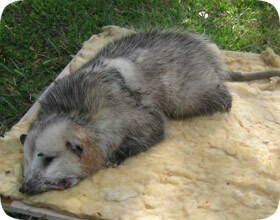 Read more about - Dead Animal in Duct or Vent. People ask me if I use special equipment to find and remove the dead animals. Well, aside from telescoping inspection mirrors and sometimes a fiber optic scope, and reciprocating saws to cut holes, not really. There is no special "odor detection machine" that I use to find the deceased wildlife carcasses. My big, fancy tool? - My nose! Yes, I just sniff and sniff, like a dog, right on every wall and ceiling, until I narrow down and find the source of the odor. That's it! Sometimes it takes a lot of hard work and patience, and most of all, persistence! I never give up until I find the body. I've got many years of experience, and I understand animal behavior and building architecture, and I've gotten really good at finding those dead animals. I trust that anyone that you hire from my national directory will also have the experience and patience to find and remove dead animals. CLEANUP: After I remove the carcass, I bag it and take it away to be incinerated. I then mop up any juices or maggots, and spray the area down with a special biological cleaner that breaks down the biomass and stink molecules. All you have to do is let your house air out. Open the windows, and the smell goes away very quickly once the dead animal is gone. Why did you get a dead animal in your house to begin with? Because you had a live animal in there just a few days ago! You should have addressed the problem of hearing the scratching and running noises in your attic or walls before it became an even bigger problem of a terrible smell. In most cases in which I remove dead animals, the homeowner ignored a live animal problem. Some people don't do anything until the wires get chewed, or there's a bad smell or something really bad. So be it. When I remove a dead animal, I also find out how that animal got inside in the first place, and I seal those holes shut, so the problem doesn't happen again!